A new business has opened its doors in the Carney portion of Parkville. On Thursday morning, Councilman David Marks joined employees of Maryland Medical First, PA at the opening of their new location. Maryland Medical First, PA employs 21 people. The practice specializes in internal medicine and geriatric care for patients aged 18 and up. Dr. Narender Bharaj, MD, CMD, built the new office along the heavily-traveled Joppa Road corridor. 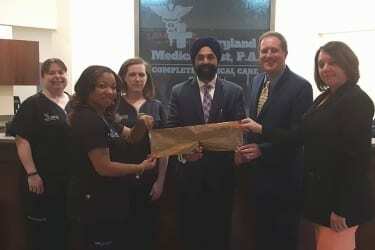 “We look forward to continue providing quality health care and outstanding professional standards,” Dr. Bharaj added.